Why Is Glennon Doyle Melton So Unhappy? I had never heard of Glennon Doyle Melton until the Washington Post published an article about her, September 8, 2016. Ms. Doyle Melton is attractive and slender, lives in an upper middle class neighborhood, has a husband (although they are now separated), three good-looking children and more-than-adequate finances. She is the author of an extremely successful blog, momastery.com, which gets seven million readers per week, and two best-selling books, Love Warrior (Flatiron, 2016) and Carry On, Warrior (Scribner, 2012). In fact, there IS something wrong when your kitchen terrifies you and a well-to-do life with normal children strikes you as “brutal” and “broken” (her words). I am not saying this to be catty, because Doyle Melton is bravely speaking the truth about her life, and it resonates with millions of women. But not feeling moments of pleasure and joy every day when you are bringing up children—even though your marriage may not be perfect or the finances stretched or the kitchen chaotic—this is not normal. What’s the problem? It’s a question she keeps asking. Doyle Melton also suffered from Lyme disease, which means she has had a big dose of gut-deadening antibiotics. So it seems that Doyle Melton is consuming a typical American “healthy” diet, probably eating plenty of vegetables, but using toxic vegetable oils and avoiding animal fat, zapping her food in the microwave, and keeping herself going with coffee (and possibly diet sodas). It’s no stretch to suspect adrenal fatigue brought on by malnutrition (especially a shortage of vitamin A), constant caffeine stimulation and damaged gut flora. This kind of diet can make anyone feel awful and unhappy—with brains starving for the things we get from animal fats—vitamins A and D, cholesterol and arachidonic acid, to name a few. We need these compounds to make feel-good chemicals, to deal with stress, even to get pleasure from completing tasks. As I have often said, when these nutrients (especially vitamin A) are low, every little thing—even finding matching socks—is stressful; when we are replete with the nutrients we need, especially vitamin A, when our brains are well nourished, stress is exhilarating, and we are able to get pleasure from the little things in life—like outings with children and cooking a healthy meal (in a regular oven, not the micro-wave). Doyle Melton expresses justifiable concern when her daughter worries about becoming “too fat.” A main cause of unhappiness in women, she argues, is the impossible standards of thinness and beauty that girls are exposed to in the fashion magazines. I agree that these are impossible standards, but remain skeptical that these images are the main thing ruining our young women. Wanting to be attractive and worrying about being slender enough are concerns that teenage girls have shared for centuries, long before the fashion magazines. All young people want to be attractive and in a perfectly nourished world they would be attractive. No, it is not the presence of impossible standards in the magazines that causes so much havoc in the life of young women, but the awful dietary advice they get from the same pages—namely that to be attractive, they need to avoid animal fats. The soulless diet young women end up eating—skim milk, vegetable oils, dry vegetables, diet sodas, skinless chicken breasts, butterless bread, breakfast cereals, processed juices, with the inevitable splurges on ice cream, cookies, donuts, etc.—is a recipe for depression, addiction, unhappiness and—for many—weight gain. My advice to Doyle Melton—and this comes from the heart—is to get yourself and your family on a diet of nutrient-dense food before it is too late. Splurge on butter, egg yolks, cream, cheese, sausage and bacon, and take some cod liver oil (a scary thought, I know, but you will get used to it)—and you will be amazed at how much better you feel, how the coffee will not be necessary, how a feeling of contentment will creep into the little things you do. And your children will mellow out as well—whining and arguing less. 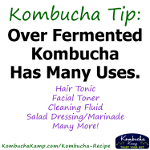 In order to feel really good, add raw milk, bone broth and lacto-fermented foods to your diet. What happens when women continue their “healthy” American diet as they age—after the children are gone—this will be the subject of a future blog. Stay tuned. The Weston A. Price Foundation has led the way in teaching the importance of animal fats and the fat-soluble vitamins for health and happiness. See this fascinating article by Chris Masterjohn. Consider becoming a member to support the work we do. Very disappointed in this post. While I agree with and follow the dietary principles laid out in Nourishing Traditions, I feel that judging Glennon M. Doyle’s struggles based on a photo of her fridge’s content and a few quotes is hypocritical. Doyle writes about her life in a humoristic way, and shares her struggles in a way that is refreshingly honest, and has issues that cannot all be made better by changing what she eats. Finally, saying that “wanting to be attractive and worrying about being slender enough are concerns that teenage girls have shared for centuries, long before the fashion magazines” is simply not true! Slenderness is not a universal beauty concern, and certainly has not been throughout history. That a researcher such as you, Ms Fallon, would imply so, makes me question your judgement in other areas. While I potentially agree with what might be sound nutritional advice to our beloved Glennon (no, I don’t know her personally, but her words of truth and courage about the challenges of motherhood – no matter how well we may be eating – are a liferaft to millions, including me!) – I am stung and disappointed that this article is so full of judgement and distain! How is this helpful? Just because someone like Glennon is a public persona, doesn’t really offer free reign to call her out in such a hurtful way & criticize the choices she’s made by pointing fingers. Offering wise and kind nutritional coaching to someone who is looking to feel better is one thing – shaming a real woman who is doing the best she can, and who didn’t ask for advice is just downright cruel. With loving blessings for the good work you do & all the help it can offer to those who want it – can we keep our focus on that? Loving your blog. Absolutely agree. I faithfully followed the low fat and high processed diet for most of my adult life and am still healing my brain from depression and my body from obesity. Thank you so much for this. I too have used dietary changes as described here to correct my own lifelong depression – it completely changed my ability to handle my life. Thank you for this article, I hope others can benefit from your suggestions. I, also, was dissappointed when I read this. While we follow a traditional food diet, Nothing turns me off more than a high and nightly nutritional speech. I think that condescending mentality is harmful and discouraging. As the first comment or wrote, to take a snap shot of her life and pick it apart is unfair. It also negates all the powerful work she has done to support thousands of women. While I agree with the stated facts, I think there is a more tactful way to get a message across. The story would have made just as much impact if the persons name would have been left out of it. Maybe this is a sad reach to try and gain exposure on your new blog. This is a highly respected woman who was just publicly shamed, without knowing her at all. The condition of your HEART has just as much impact on your health as the condition of your gut. I completely agree on what you are saying Sally, about a SAD diet causing stress and emotional overwhelm. Giving your body the nutrients it needs in the from of unprocessed foods and clearing out the jump is so important for health and wellness. We should be more focused on teaching our children and daughters how to cook real whole foods instead of worrying about body image. This would go a long way in helping our children live long healthy and happy lives. And I find that your responding to someone who has put her refrigerator and kitchen in the public eye on her own website, appropriate to comment on. Thank you for your continued work to encourage heath and nutrition in our families. Love this post. Before I got a third of the way through, I was thinking, “This woman needs some animal fat in her diet!” Also, I read the Anne of Green Gables books, which were written in the early 1900’s, and weight is mentioned a little in those books. Well said Sally. The WAPF way of eating saved my life. Oh, the cholesterol reducing diet I was eating a decade ago! It just about killed me. Reading your well researched, no nonsense articles written with integrity saved my life. The reference to this Mum’s wired and stressful life here is a good analogy for a lot of similarly stressed and stressy Mums. This is what is wrong with a whole lot of women who rush about from pillar to post, in greater and greater frenzy, while their bodies, and their kids bodies get increasingly malnourished. They think they are doing the right thing. But they are really not. If she was on a better diet, she would have nothing to write about, she would be so happy. A public person, writing publicly about their private life invites public reviews of her work (including criticism). People have a right to express an opinion. Nothing wrong, bad, inappropriate or hurtful about that. I agree with the previous poster, she needs butter in her life. I am happy when I consume loads of ghee and butter, and cream, and salmon, and, and, and……!